The first glimpse of data from the full array of a deeply chilled particle detector operating beneath a mountain in Italy sets the most precise limits yet on where scientists might find a theorized process to help explain why there is more matter than antimatter in the universe. This new result, submitted today to the journal Physical Review Letters, is based on two months of data collected from the full detector of the CUORE (Cryogenic Underground Observatory for Rare Events) experiment at the Italian National Institute for Nuclear Physics’ (INFN’s) Gran Sasso National Laboratories (LNGS) in Italy. CUORE means “heart” in Italian. CUORE is considered one of the most promising efforts to determine whether tiny elementary particles called neutrinos, which interact only rarely with matter, are “Majorana particles” – identical to their own antiparticles. Most other particles are known to have antiparticles that have the same mass but a different charge, for example. CUORE could also help us home in on the exact masses of the three types, or “flavors,” of neutrinos – neutrinos have the unusual ability to morph into different forms. 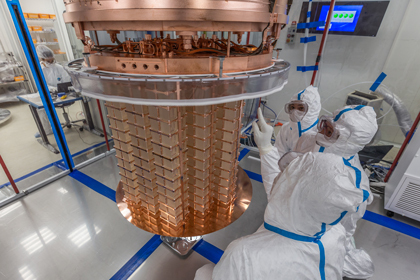 “This is the first preview of what an instrument this size is able to do,” said Oliviero Cremonesi, a senior faculty scientist at INFN and spokesperson for the CUORE collaboration. Already, the full detector array’s sensitivity has exceeded the precision of the measurements reported in April 2015 after a successful two-year test run that enlisted one detector tower. Over the next five years CUORE will collect about 100 times more data. Yury Kolomensky, a senior faculty scientist in the Nuclear Science Division at Lawrence Berkeley National Laboratory (Berkeley Lab) and U.S. spokesperson for the CUORE collaboration, said, “The detector is working exceptionally well and these two months of data are enough to exceed the previous limits.” Kolomensky is also a professor in the UC Berkeley Physics Department. The new data provide a narrow range in which scientists might expect to see any indication of the particle process it is designed to find, known as neutrinoless double beta decay. “CUORE is, in essence, one of the world’s most sensitive thermometers,” said Carlo Bucci, technical coordinator of the experiment and Italian spokesperson for the CUORE collaboration. 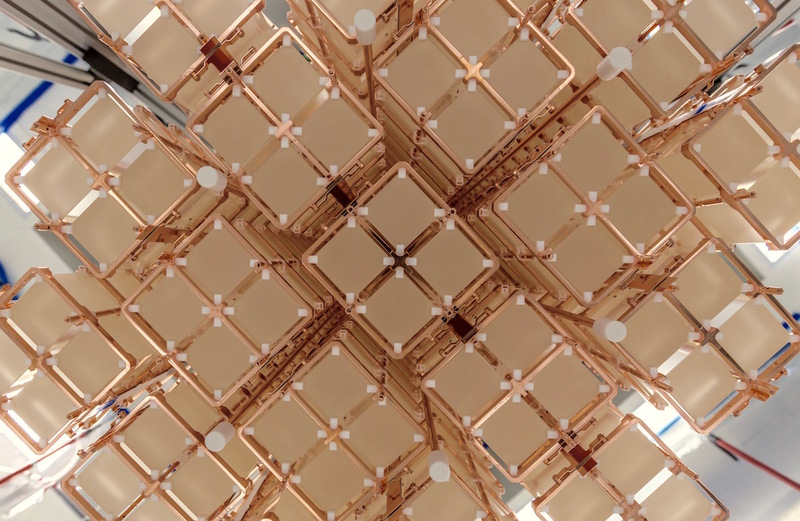 Its detectors, formed by 19 copper-framed “towers” that each house a matrix of 52 cube-shaped, highly purified tellurium dioxide crystals, are suspended within the innermost chamber of six nested tanks. Cooled by the most powerful refrigerator of its kind, the tanks subject the detector to the coldest known temperature recorded in a cubic meter volume in the entire universe: minus 459 degrees Fahrenheit (10 milliKelvin). The detector array was designed and assembled over a 10-year period. It is shielded from many outside particles, such as cosmic rays that constantly bombard the Earth, by the 1,400 meters of rock above it, and by thick lead shielding that includes a radiation-depleted form of lead rescued from an ancient Roman shipwreck. Other detector materials were also prepared in ultrapure conditions, and the detectors were assembled in nitrogen-filled, sealed glove boxes to prevent contamination from regular air. Together weighing over 1,600 pounds, CUORE’s matrix of roughly fist-sized crystals is extremely sensitive to particle processes, especially at this extreme temperature. Associated instruments can precisely measure ever-slight temperature changes in the crystals resulting from these processes. The measurements carry the telltale signature of specific types of particle interactions or particle decays – a spontaneous process by which a particle or particles transform into other particles. In double beta decay, which has been observed in previous experiments, two neutrons in the atomic nucleus of a radioactive element become two protons. Also, two electrons are emitted, along with two other particles called antineutrinos. Neutrinoless double beta decay, meanwhile – the specific process that CUORE is designed to find or to rule out – would not produce any antineutrinos. This would mean that neutrinos are their own antiparticles. During this decay process the two antineutrino particles would effectively wipe each other out, leaving no trace in the CUORE detector. Evidence for this type of decay process would also help scientists explain neutrinos’ role in the imbalance of matter vs. antimatter in our universe. Neutrinoless double beta decay is expected to be exceedingly rare, occurring at most (if at all) once every 100 septillion (1 followed by 26 zeros) years in a given atom’s nucleus. The large volume of detector crystals is intended to greatly increase the likelihood of recording such an event during the lifetime of the experiment. CUORE is supported jointly by the Italian National Institute for Nuclear Physics Istituto Nazionale di Fisica Nucleare (INFN) in Italy, and the U.S. Department of Energy’s Office of Nuclear Physics, the National Science Foundation, and the Alfred P. Sloan Foundation in the U.S. The CORE collaboration includes about 150 scientists from Italy, U.S., China, France, and Spain, and is based in the underground Italian facility called INFN Gran Sasso National Laboratories (LNGS) of the INFN. Berkeley Lab leads the U.S. nuclear physics effort for the international CUORE collaboration. CUORE collaboration members include: Italian National Institute for Nuclear Physics (INFN), University of Bologna, University of Genoa, University of Milano-Bicocca, and Sapienza University in Italy; California Polytechnic State University, San Luis Obispo; Berkeley Lab; Lawrence Livermore National Laboratory; Massachusetts Institute of Technology; University of California, Berkeley; University of California, Los Angeles; University of South Carolina; Virginia Polytechnic Institute and State University; and Yale University in the US; Saclay Nuclear Research Center (CEA) and the Center for Nuclear Science and Materials Science (CNRS/IN2P3) in France; and the Shanghai Institute of Applied Physics and Shanghai Jiao Tong University in China. 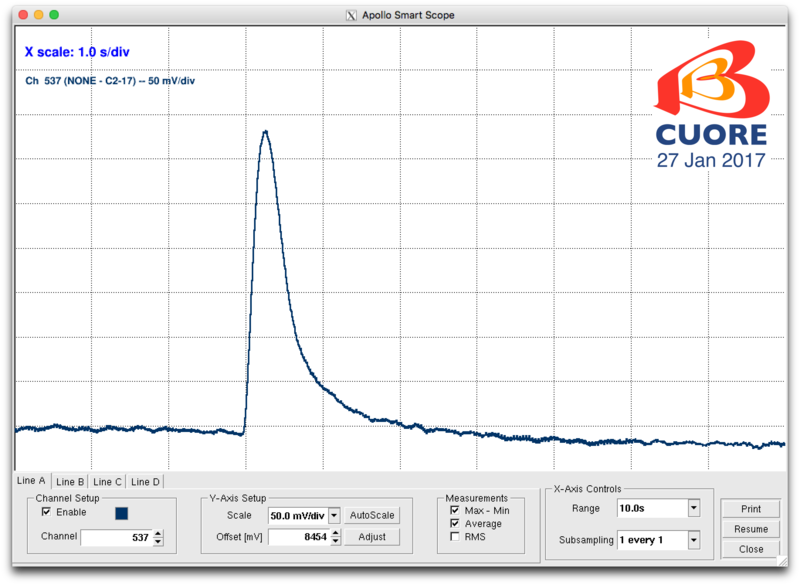 We're very excited to announce a new milestone for our experiment: the CUORE detector has reached its operating temperature of 10 mK! This is over one ton of tellurium dioxide and copper cooled to a hundredth of a degree above absolute zero. We are now seeing clear signals from the detector, and our next phase is the optimization of our electronics and analysis software. Soon, we will begin taking official data, so stay tuned! Thank you to all CUORE Collaborators, past and present, who have helped us reach this milestone! The CUORE experiment, located at the Gran Sasso National Laboratories (LNGS) of the National Institute of Nuclear Physics (INFN) in Italy, has completed the installation of 19 "towers" that make up the detector. The delicate and precise operation, which required dedicated efforts of specially trained teams of scientists, engineers, and technicians, and logistical support from the entire collaboration, was completed on August 26. "All of the 19 towers that make up the detector, consisting of 988 Tellurium oxide crystals and weighing nearly 750 kg (1650 lbs), are now suspended from the coldest point of the experiment cryostat," said Oliviero Cremonesi, the experiment’s spokesperson. "Now the collaboration is preparing for the finishing touches to the system, and will then proceed in the coming months with the closure of the cryostat, the cooldown, and the start of science operations." CUORE is an experiment designed to study the properties of neutrinos. In particular, the experiment looks for a rare phenomenon called neutrinoless double beta decay. Revealing this process would demonstrate a Majorana nature of neutrinos, providing a possible explanation for the prevalence of matter over antimatter in the universe. The experiment is an international collaboration of about 165 scientists from thirty institutions in Italy, USA, China, and France. CUORE is supported jointly by the Italian National Institute for Nuclear Physics (INFN) and the Department of Energy’s Office of Science and National Science Foundation in the US. On December 10, 2015, CUORE was featured on the first episode of "Innovation Place", produced by La Repubblica for Repubblica TV and narrated by Riccardo Luna. The subtitled video is below. CUORE was featured in the April edition of Symmetry Magazine. Read the article at symmetrymagazine.org.